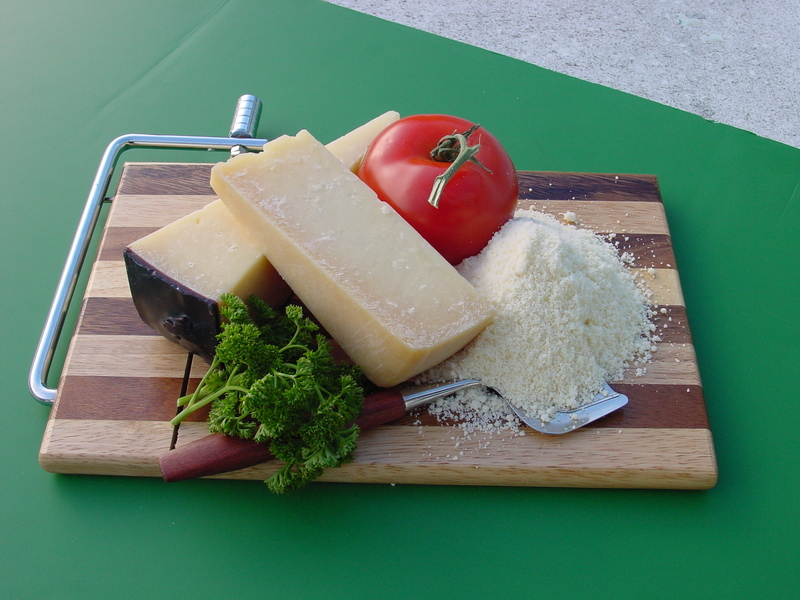 Our grated Parmesan cheese uses the finest Italian cheese that has been aged. We process this and shred it according to the needs of our clients. We sometimes blend with other cheeses (e.g. Romano-Reggiano). The grating is according to our customer specifications. The product is sealed and with correct storage, has a 12 month shelf life. Our products are available in supermarkets, as well as kitchens and tables of fine Italian restaurants. Our formulations can also be blended, esp . with Reggiano. Parmigiano-Reggiano is made from raw cow’s milk. The whole milk of the morning milking is mixed with the naturally skimmed milk (it is left in large shallow tanks to allow the cream to separate) of the previous evening’s milking, resulting in a part skim mixture. The milk is pumped into copper-lined vats (copper heats and cools quickly). Starter whey is added, and the temperature is raised to 33–35 °C (91–95 °F). Calf rennet is added, and the mixture is left to curdle for 10–12 minutes. The curd is then broken up mechanically into small pieces (around the size of rice grains). The temperature is then raised to 55 °C (131 °F) with careful control by the cheese-maker. The curd is left to settle for 45–60 minutes. The compacted curd is collected in a piece of muslin before being divided in two and placed in molds. There is 1100 L (291 US gallons or 250 imperial gallons) of milk per vat, producing two cheeses each. Our naturally produced Mozzarella Cheese is freshly stretched every day. This cheese is by far some of the freshest mozzarella you will ever taste. Most fresh water mozzarella bought in stores could have been stretched months before bought. The difference is our Mozzarella does not contain any preservatives! a great serving cheese with crackers! This is one of our finest and smoothest cheeses available. For more information or to to inquire about doing business with us, please contact us at this Contact Form or email info@imbusa.com with detailed information. Good prompt service has always been a key distinction of the quality of our business versus others. We know you’re looking out for your customers, so we’re looking out for you and we’ll get back to you within the day. Nearly all of our products can be customized to fit the needs of our customers. Halal products available upon request.